Planning a romantic October 31 dinner with your fiancé? This fab dessert is a Halloween treat that’s swoon-worthy! 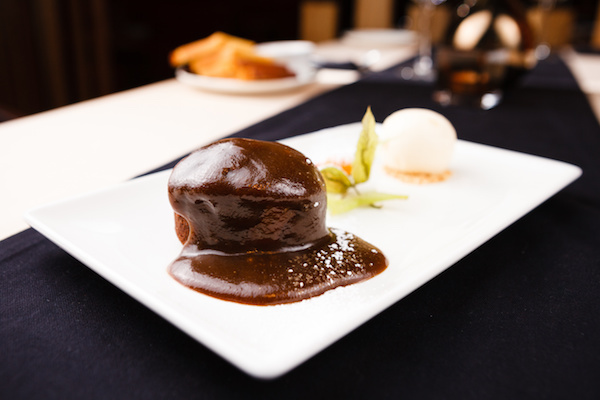 Yes, it’s Sticky Toffee Pudding, but there’s a bonus. It’s more nutritious than it looks. Unlike a traditional sticky toffee pudding, this one is made with prunes. And guess what? New scientific research shows that eating a daily serving of five prunes supports heart and bone health; and may even help slow and prevent bone loss, lowering the risk of osteoporosis. Who knew? 1 – Preheat oven to 350 F° (180°C). 2 – In a medium bowl with a hand mixer on medium high speed, cream together butter and sugar. 3 – Beat in syrup, eggs, all spice and vanilla. 4 – Add flour and baking powder and combine with a spoon just until flour is absorbed. 5 – Finely chop California prunes and add to mixture along with nuts. 6 – Add water and stir. 7 – Pour into a 9-inch (23 cm) square, greased cake pan and bake in oven for 35-40 minutes or until a skewer comes out clean. 8 – Place butter, sugar and cream in a small saucepan and simmer over low heat until thick and glossy (approx.10-15 mins). 9 – Serve pudding hot from the oven with Toffee Sauce and ice-cream.